As someone who had the privilege to attend school in Middlebury, Vermont for four years, I have been deeply saddened and horrified to see the videos coming out of the state today. There have already been 39 confirmed deaths from Hurricane Irene and more than 5.5 million people lost power from North Carolina to Maine. Nowhere has the damage been worse than Vermont though. There are currently 15 towns in Vermont and New York that have been cut off by the flooding. Damages from the storm could top $7 billion and Vermont officials seriously considered flooding the capital, Montpelier, to save a nearby dam. Officials confirmed that two people died in the waters. This is the second major disaster as a result of storms. We had storms this spring that flooded our downtowns and put us through many of the same exercises that we’re going through right now. We didn’t used to get weather patterns like this in Vermont. The point is, we in the colder states are going to see the results of climate change first. Here are some of the most shocking videos posted online. This video shows the normally calm and tranquil little stream in Brattleboro, Vermont turned into a torrent of water. I was there just a couple of months ago. This video shows a bridge in Rockingham, Vermont being swept away by the water. The covered bridge dated back to 1870. Here an empty car is swept down the river in Bennington, Vermont. This is the view in Chester, Vermont. This video shows the devastation at the Grafton Cheese Company. Thankfully, the company reports everyone is safe and the cows are okay. Devastating news from the breweries in the state as well. 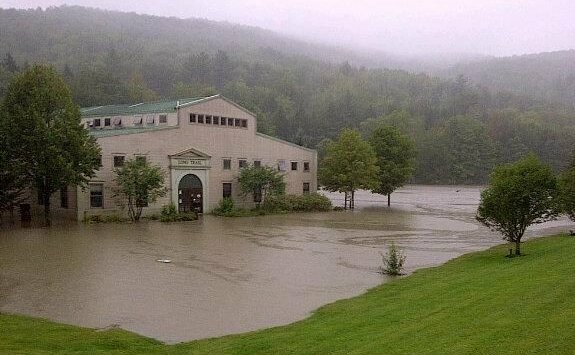 A photo of Long Trail Brewery completely underwater was posted, though apparently the situation is not completely dire. 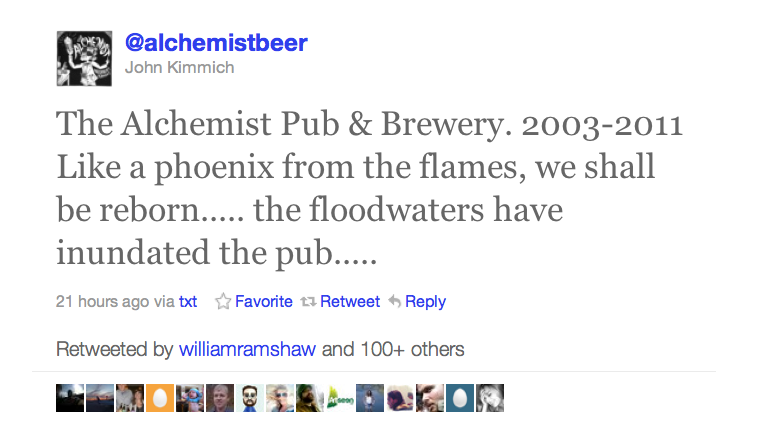 The same cannot be said for The Alchemist Pub & Brewery, which was destroyed in the flooding in Waterbury. Having been to The Alchemist, they are truly wonderful people who make amazing beer. I hope this closing is only temporary. The Flat Street Brew Pub in Brattleboro also appeared to be completely flooded yesterday. No word on the scale of damage. Our thoughts are with Vermont in this difficult time. Consider a donation to the Red Cross.